Did you know that the Curriculum Collection Teaching Tools contains board games in addition to math manipulatives, puppets, and robotics? Many items have a direct correlation to a teaching standard. Others simply support social interaction, collaboration, and play – for both the preK-12 crowd as well as the rest of us. Teaching Tools will now be featured at the New Arrivals Island alongside the more scholarly fare. 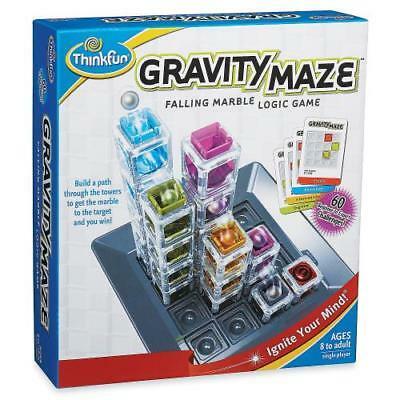 Test your visual perception and reasoning skills with this new one, Gravity Maze, a single player game. Choose a beginner, intermediate, advanced, or expert challenge card, place the starting block and red target block as shown in the challenge card, and using only the color cubes indicated on the card create a maze that will carry the marble from the start to the red target block. It sounds simple, but don’t get cheeky and skip from the #1 beginner card to an intermediate card as I did. I abandoned that shortcut after a few failed attempts, and humbled myself back to the beginner cards. Stop in before taking off for Thanksgiving break, browse the New Arrivals Island and Teaching Tools collection on the 2nd floor, and pick a few games to check out for the holidays! This entry was posted in new stuff tuesdays and tagged board games, curriculum collection, games, teaching tools. Bookmark the permalink.